Stainless steel swivel head with sealed stainless steel bearing races. Fitted with stainless steel cage frame designed to hold the windsock away from the mast. 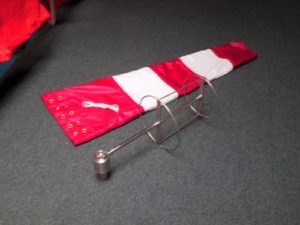 It extends approximately 30cm/12 inches into the windsock opening. For use with lace-on/eyeletted windsock (not included). For marine, chemical and industrial applications. Price on quotation dependent upon the frame size. CALL US ON 01780 740644 we welcome Credit Card Payment.